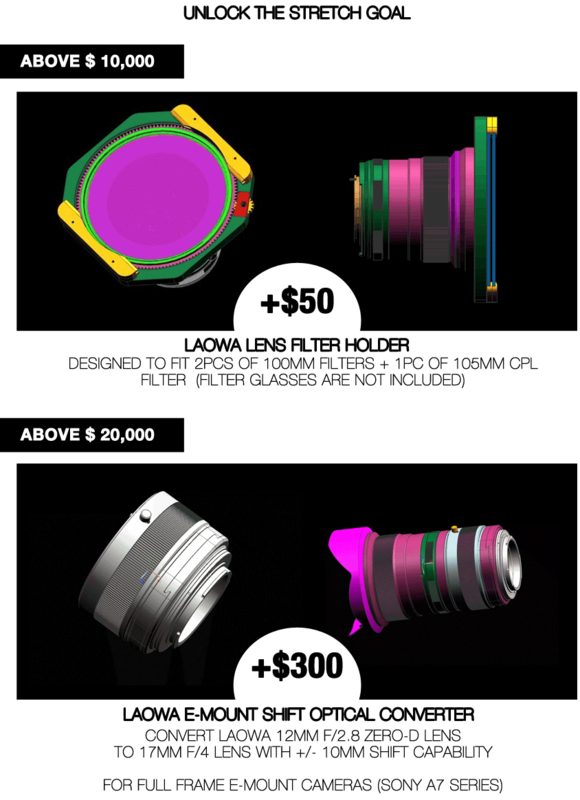 The Magic Shift adapter is a stretch goal from Venus Optics, for the Laowa Zero-D 12mm f/2.8 distortion-free lens that will be launched on July 30th at 7pm EST via Kickstarter. Early birds will get a discount on the Zero-D during the Kickstarter period before the lens is available after the Kickstarter for $949. I am hopeful they will reach the stretch goal of $20,000 raised to release the Magic Shift adapter for the Sony a7, which enlarges the full frame image circle of the Zero-D by shifting the lens +/- 10mm. This adapter will turn the Zero-D into a 17mm f/4 or 10mm f/4. The adapter is, arguably, more interesting than the lens because you can use it with other lenses, but optimal performance can not be ensured since the adapters is designed for the 12mm f/2.8 Zero-D. This entry was posted in 3rd Party Lens, Accessories, Deals, Press releases and tagged Laowa Zero-D 12mm f/2.8, Magic Shift adapter, The Magic Shift Adapter. Bookmark the permalink. Trackbacks are closed, but you can post a comment.